Another week has gone by. Is it just me or has the first part of this school year FLOWN by? Hard to believe that there is only one more week before Christmas break. 1.) From the Visual Thesaurus, A spelling bee competition online. Test out your spelling skills. You compete and score points for correctly spelled words and streaks of correctly spelled words. If that is not enough for you, here is another Spelling Bee site you can try. Oh, but I am not done, from Dictionary.com here is another spelling game. 2.) Figment is a site that allows students 13 and older to share their writings with others. I am not a fan of reinventing the wheel, so head on over to Kelly Tenkely's iLearn Teachnology Blog for a good explanation. 3.) StoryJoin is a site similar to Figment in that it provides a place for students to share their writing with other authors looking for an audience. They have a story of the week and writings are divided into several different categories. For more information read the opening paragraph as it describes their site. 4.) TextNovel is...guess what, another site for students to share their writing with an available audience (is it just me, or does this say something about the state of writing education when students have to go online to feel that their writing has an audience?) The difference is that TextNovel allows users to submit their writings via cellphone. 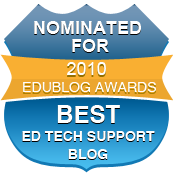 The Innovative Educator does a good job of discussing this website. 5.) Woodlands Literacy Zone offers interactive English games and activities broken down into several different categories and units of study. 1.) New Zealand Maths is a site that offers units for math teachers separated by subject matter that then have links to various resources that you can use in the classroom. 2.) MathCentre is a site that offers resources that you can search for by narrowing down your search topic. There are over 10 different types of resources, such as iPod video segments, online quizzes, etc. 3.) Free Math Help offers just what the title of the website says. There is also a question of the day that students can answer. Students can enter in a math problem and then the computer will solve the equation for them and even provide them the steps to the solution. Another site is the Equation Solver. You input a linear equation, systems of linear equation, or single quadratic equation and it will solve it for you. HOW DO KIDS NOT PASS MATH CLASS WITH SITES LIKE THIS??? KIDS STILL DON'T DO MATH HOMEWORK??!! 4.) "Mathwire.com is designed to provide activities and appropriate worksheets for teachers to use in their classrooms. All activities and worksheets support the constructivist approach to learning mathematics and the NCTM Standards." 5.) Yummy Math is another site that provides teachers and students resources for learning math that is relevant to the real world. Free Technology for Teachers has a good write up about this site. 6.) If you have a SMARTBoard you can download this resource of pre-made charts and graphs to use with your students. 7.) 20 Incredible TED Talks for Math Geeks is a great list. If you don't know what TED talks are, I highly recommend that you start watching them. 1.) 51 Awesome Science Experiments and Videos for kids is a great list to get your students interested in science. 2.) The Interactive Science Dictionary is a site that allows users to learn the meaning of science words. There are videos and it provides users the ability to ask questions as well. Science words can sometimes be hard to pronounce, so this site will also help you learn to pronounce them. 3.) Operation Conservation is a wiki that provides resources for teaching about the environment and learning to conserve energy and resources. 4.) Learn Genetics from the University of Utah is a comprehensive site that allows visitors to learn all they need to know about genetics. A great resource for teachers and students. There are several virtual labs available as well. 5.) Looking to connect with NASA? Well, now you can. NASA has created a directory so that you can collaborate and connect with astronauts and other NASA scientist. You can connect via Twitter, Facebook, Foursquare, MySpace, Flickr, YouTube, and Gowalla. 1.) StreetLaw has put together a great site for Landmark Supreme Court Cases. Whether you are teaching them or students are learning them, this would be a great starting point. 2.) Virtual Middle School Library is a site that offers tons of links and resources for teaching social studies. They are broken down by subject matter. Don't let the title fool you, these will work at the high school level as well. 3.) Our Story is a site dedicated to sharing the stories of American Citizens. There are activities, books, and field trip suggestions for learning about American History. 4.) From the Library of Congress is a great map collection. There are six different categories of maps that visitors can select from to view and use. If you plan on teaching a lesson involving maps, I highly recommend examining this site first.